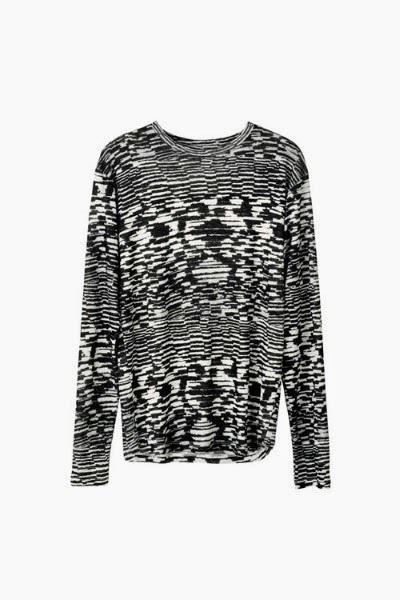 Yesterday, I (almost by accident) found out that the pieces of the Isabel Marant For H&M collection were leaked. Of course, the first thing I thought was: 'Hooray! That will be only womenswear leaked, I'll have to wait for the menswear until the real presentation of the collab!' Luckily, that wasn't the case. On the site of the British Vogue, the whole collection was displayed. 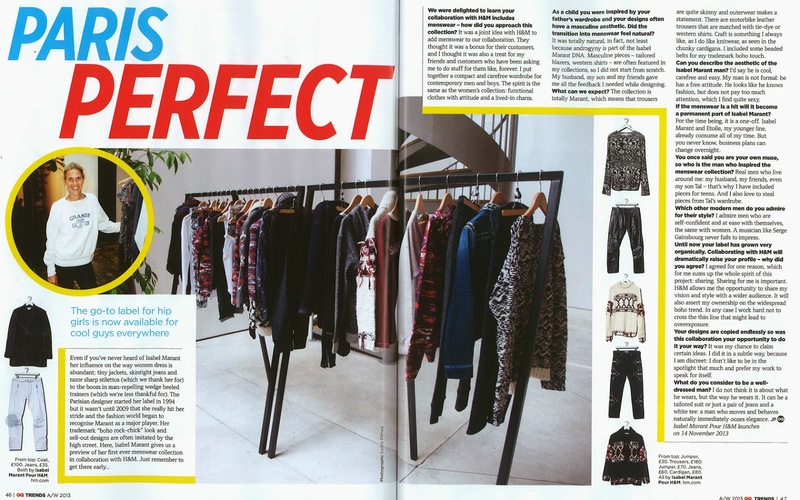 I also found an arcticle of Isabel Marant with GQ UK, discussing the collection for men. Some of the items are displayed around the text, showing very Marant-alike pieces. 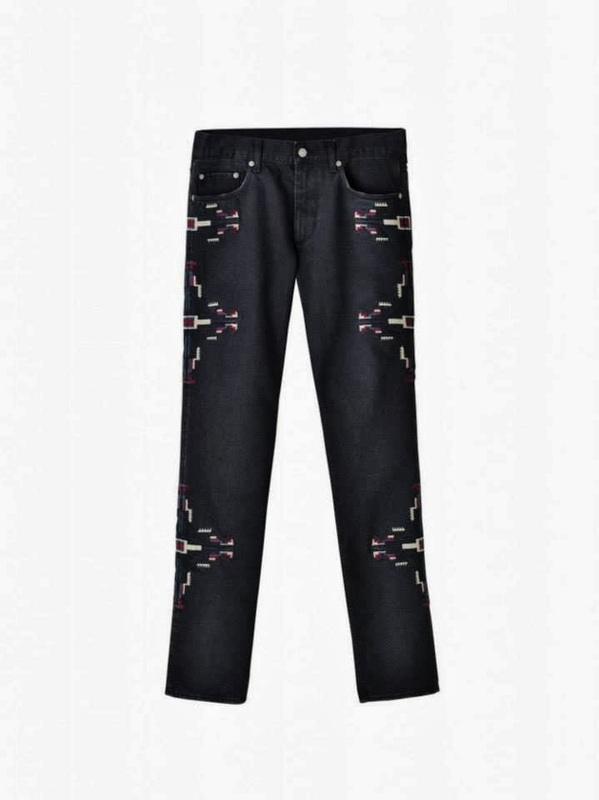 Isabel herself said the line for men was absolutely Marant: Quite skinny jeans and trousers and outerwear that makes a statement. 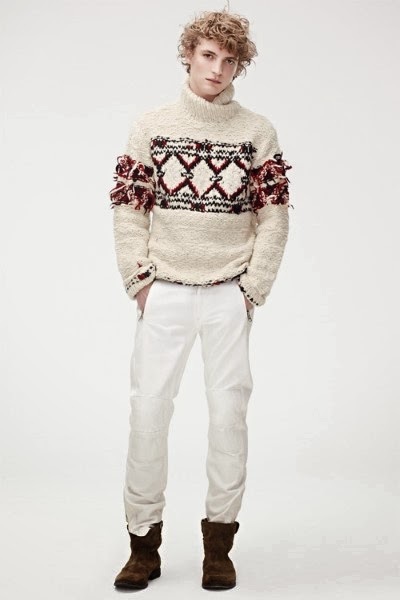 The designer says she gets her inspiration for the men's collection from the men around her: her husband, son, friends,... There are some prices next to the items and I must say they are really affordable. Of course there will be those people who say that the whole 'H&M X ...' Circus is just a spin-off of the real deal, and actually it is, but I think the collabs are a great way for the designers to reach a bigger, younger crowd that can't afford a real designer piece yet. I am officially starting to save until the collection is available on November 14, let's hope I can get my hands on some items. 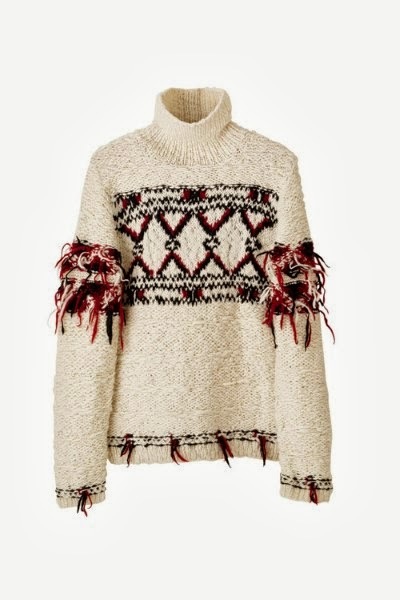 My favorites up to now are the grey knitted jumper, the jumper with crewneck and red/black 'destroyed' fringes and the jeans with the Aztec print on the sides. What do you think of the collection up to now? I followed you on Facebook, I do not have Facebook yet, and no Bloglovin either :) Will come soon, thanks for reacting!